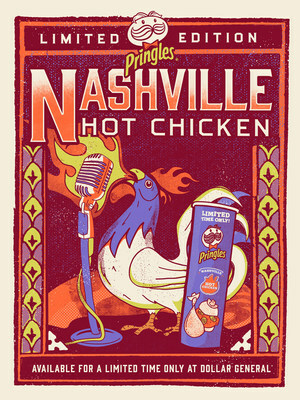 Pringles® Brings The Heat With Its First-Ever Nashville Hot Chicken Flavor! BATTLE CREEK, Mich., June 26, 2018 /PRNewswire/ -- Nashville is to thank for of one of America's most popular and spicy culinary dishes: Hot Chicken. And now for the first-time ever, Pringles® is bringing Nashville to the rest of America with the launch of Pringles Nashville Hot Chicken Flavor. Pringles is known for its insanely accurate flavors and the ability to put any dish into crisp form – and this new creation is no different. Legend says, in the 1930s, Nashville Hot Chicken was initially created to inflict pain when an angry girlfriend added extra seasonings to chicken batter she fed to an unsuspecting partner—who ended up loving the hot and spicy creation made with jalapeño, cayenne pepper, and paprika. Over 80 years later, Nashville Hot Chicken is one of the best-known culinary traditions and has gained popularity nationally. Pringles Nashville Hot Chicken is inspired by the traditional version of Nashville Hot Chicken, and you can bet that it's hot! "Americans are going crazy for Nashville Hot Chicken. If you love spicy snacks, this new flavor of Pringles is made just for you, and you don't have to go all the way to Nashville to try it. Pringles Nashville Hot Chicken Flavor tastes insanely close to the real thing," said Kurt Simon, senior director of brand marketing for Kellogg's U.S. Snacks division. Becky Wolfe, Product Development Scientist, said "When we were creating Pringles Nashville Hot Chicken Flavor we instantly knew this would be a success. Pringles 'hot' flavors are some of the most fun to develop. Our team sampled the different spice combinations so we could get this flavor to taste just like the real deal." A Hot Chicken sandwich is traditionally served with pickles, so try stacking Pringles Nashville Hot Chicken Flavor with Pringles Screamin' Dill Pickle Flavor, plus Pringles Original Flavor for an even tangier snack! It was only fitting to partner exclusively with Tennessee-based Dollar General to bring the new Pringles Nashville Hot Chicken Flavor to customers. This summer, they're around for a limited time only, so get your hands on a can before they're gone. "Here at Dollar General we are proud to be based in Nashville. As the city is our headquarters we are familiar with the deliciously spicy Nashville Hot Chicken trend. We are truly excited to see the reception of Pringles Nashville Hot Chicken across the country," said Crystal Ghassemi Director of Public Relations at Dollar General Corporation. 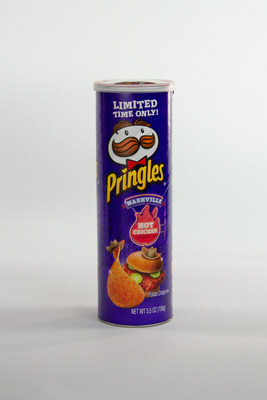 For more information, you can go online to www.Pringles.com or visit your nearest Dollar General store to learn about Pringles Nashville Hot Chicken Flavor. You can also follow us on social media at, Twitter, Instagram, YouTube and Facebook.